A Muscovite shaman tells RIR about Russian shamanism and the role this spiritual art has to play in the modern world. At the end of July, spiritual practitioners from all over the world flocked to The Call of the 13 Shamans Festival in Siberia. Among the invitees were tribal leaders from Mexico, Greenland, Mongolia and Korea. One of the selected 13 was Muscovite Mark Guslyakov, a healer, shaman and organizer of the non-commercial Dom Shamana Society. RIR's Marina Obrazkova visited Guslyakov at home and discussed Russian shamanism, as well as that in the rest of the modern world. "I'm visited by the poor, by the rich, the pathetic, the miserable, by alcoholics. My mission is to help people and I do everything I can," shaman Mark Guslyakov tells me. We are sitting in his so-called office, but in reality I would not know what to call it. The room is decorated with drawings and ritualistic objects: On the wall above the table hang Orthodox icons, in the corner lie a shaman's costume made of wolf skin and the main shaman accessory, the tambourine. I’ve come to visit Guslyakov in order to find out more about the role of the shaman in today’s world, and about Russian shamanism in particular. 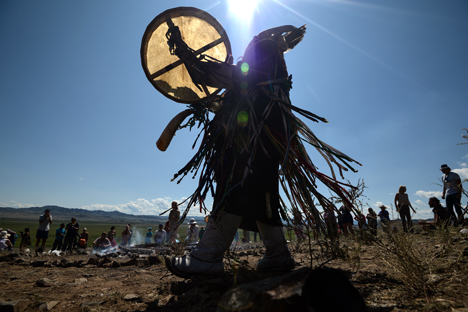 Guslyakov was one of 13 tribal leaders from around the world invited to participate in the Call of the 13 Shamans Festival, which took place in Tuva, in southern Siberia, at the end of July. He joined representatives from other nations in which shamanism continues to be practiced, including Mexico, Greenland, Mongolia and Korea. Guslyakov is dressed in a T-shirt and shorts. Even though we are in the Moscow neighborhood of Sokolniki and not in the steppe or the taiga, and instead of some guttural chant what we hear is the air conditioning unit, I am still absorbed by wonder and the feeling of the ancient world. When I arrived, Guslyakov looked around me and said in all seriousness that many people had accompanied me. During our conversation, he explained that he could see many of my ancestors. Ancestors always accompany a person and can be seen only if they had been seers, healers or spiritual masters. On the one hand, I thought that these statements were a psychological trick or something, but on the other hand, my grandmothers and great-grandmothers had indeed been healers, and other ancestors painted icons. Guslyakov does not like meeting journalists and does not have his own website. The shaman, who was born in Kazakhstan and was initiated into shamanism when he was five years old, does not say much about himself, only that he did not choose his path, that he had simply been born with certain talents that could not be annulled or removed. "Man is always drawn to something, making sketches or drawing, writing music. I can determine a person's chronic illnesses, where his ancestors lived, etc. by the color of his skin or the toes on his feet, and you don't need to study to know how to do this,” he says. “All my ancestors were healers and performed rituals, even my surname Guslyak means ‘sorcerer’," he says. "Once a day my body convulses for 15-20 minutes. Reality changes in this condition and it takes special powers in order to return to normality. I still don't understand everything." Guslyakov says that if people really need help, they find him themselves. What kind of help does one need from a shaman? He says there are many people with family problems that cannot be treated with medicine and that are capable of ruining lives. During the Call of the 13 Shamans Festival, which took place in Tuva, Siberia at the end of July, half of the locals who sought help from the shamans had spiritual problems that had caused deaths in their families. "The people couldn't pay anything for the healing, but it was impossible to refuse them," explains Guslyakov's companion Yulia. "Out of gratitude the people would leave whatever they could: food, 50 rubles ($1), some objects. Then they called the following day, thanking the shamans because they felt their lives had changed." The shamanist festival was a sign for spiritualists. Guslyakov was one of the 13 practitioners selected for the event. The festival's organizer was a shaman from Tuva, Nikolai Oorzhak. "We didn’t know that our gathering would take place during a time when many military conflicts are taking place in the world," says Guslyakov. "The aim of the event was to ask the Great Spirit what will happen with mankind, with the planet, if world shamans should unite. Today many people who practice spiritualism are warring with one another; they don't accept the other's traditions." Guslyakov says that it was possible to encounter real miracles during the festival. "Festival participants had to go to the mountains in 120-degree heat, which is too hot even for the locals. These are the conditions in which the shamans took their three-day retreat and many of them didn't have any water," he recalls. "Then the Mongolian shaman performed his ritual. He took out water containers, placed them all around and said that it would be enough for everyone. He beat his tambourine and chanted ritual songs and in three minutes came a downpour that drenched everyone's clothes and filled the containers. This was surely a manifestation of ancient wisdom, of shamanism in the form it is preserved and passed down from one generation to another." According to Yulia, shamans must be given the resources to travel to places of power, since they must use their powers to heal people and cleanse society. “Usually shamans are not wealthy people and cannot afford to travel," she explains. Guslyakov mentions that there are many people living in Moscow who genuinely can work with energies and heal people. These are often people who come from Siberia, and in general they try not to settle in Moscow, preferring to buy property in the suburbs. He also remarked that most of the shamans who give interviews, publish articles in newspapers, have blogs and organize guttural chanting concerts are not really shamans, but just want to profit from people's belief in miracles. Guslyakov is convinced that shamanism is embedded in a human's genetics. "There are certain things that you can feel right here without costumes and ritual fire, without chanting and prayer. It is something within the body. Before, shamans were determined only according to physical signs such as the color of their eyes or the pattern of their veins. But nowadays these traditions don't exist. However, despite all this, any person can feel if he is standing in front of a real shaman or not," he explains. Moreover, Guslyakov affirms that essentially shamanism can refer to any activity that man carries out in accordance with his ‘real talent’. "Shamanism is the universe's artistic talent. We cannot decide in what form this talent will manifest itself. The shaman's gift lies in the expansion of his borders of perception, of his understanding of the essence of life," he says. "Shamanism is not about writing books, it's about feeling. All people have seven senses. Besides the usual five there is clairvoyance and clairgnosis [‘clear knowing’ – RIR]. But these days man usually suppresses the last two feelings. Our ancestors, however, used them instead of the internet and the phone. They felt each other, understood each other at a distance," Guslyakov concludes.